Life has intervened to keep me away my blog this last month. Two weeks have passed since I started writing this little story from my recent cruise, which is relevant to voice talent. Drew and I were sitting in lounge chairs on the promenade deck one evening when another man and his wife sat next to us and starting talking to us. We found out that the guy’s name is Ralph; I don’t remember his wife’s name. Ralph seemed more interested in talking about himself than in finding out about us. We quickly learned that Ralph is an artist who paints geometric designs on large canvases. He handed me his business card, which had a picture of one of his paintings and the verbiage to look for Ralph on Google. I was a bit surprised that Ralph reached for his card to take it back from me when we parted company. I told Ralph that I love art, and I asked him how long it took him to create a painting. He replied, “that’s my secret.” Perhaps I was just making conversation, but for all Ralph knew, I was thinking of commissioning him to create a painting for me. As he talked, Ralph told us that he had sold his art in Beverly Hills galleries; maybe he thought we would be impressed. He then segued into a tale of a sale that made me want to bail on that male. (Sometimes I amuse myself.) A buyer at one of these Beverly Hills shows wanted to buy a painting that he had priced at $1200 and asked him to cut his price to $700. After he agreed to the price cut, the buyer wrote a check. It turned out that the buyer was Paris Hilton’s mother, and she planned to give the painting to Paris as a present. Ralph said that if he had known the identity of the buyer, he wouldn’t have cut the price. Five marketing lessons were once again made clear to me that evening when listening to Ralph. Did you catch them? 1) In a service-oriented business and in life overall, you can only be of service to others if you listen more than you talk. Like Ralph, many people find themselves to be a favorite topic. Whether I’m socializing personally or networking as a professional voice talent, I ask questions of the other person. When you find out about another person, you are forming the foundation of a relationship. Talking about yourself just seems a self-centered way to pass the time. You’ll remember that I had expressed interest in Ralph’s art. As an artist and presumably an entrepreneur, Ralph should be open to prospective clients coming from any source. We voice talent also need to be aware that the next job could come from someone to whom we haven’t marketed. In fact, I have noticed that when I put energy into a focused marketing plan, the next job comes from someone out of the blue. I believe that whatever you put out into the world comes back to you, and usually it’s in a way you didn’t expect. 2) Be as open and willing to explain your work to someone who expresses interest. It was odd to hear Ralph tell me that his time was his secret, and that remark alerted me that I shouldn’t ask any other questions about his work. Whenever people ask me about voice-over, I am more than happy to answer their questions. I also think it’s important to educate people about the time required for a project so that they will better understand my pricing. or trust me, you haven’t a chance. 3) When you hand your business card to someone, you shouldn’t expect to get it back. I read a job hunting book once in which the point was made that every good salesperson always has something to leave behind. In some cases, the only thing you can leave is your business card. The whole reason to have business cards is so that someone can remember you. I carry my cards with me almost everywhere I go; you never know when a conversation about voiceover might occur. I admit I don’t have them with me when I’m sitting in a lounge chair on a cruise ship. However, I do have them in my cabin and would follow up with anyone if the situation warranted it. Since Ralph had a card with him, I would think he would be happy if I kept it. If I had his card, I not only would know his last name, but I’d know how to contact him if I decided I wanted one of his paintings. Ralph may have kept his card but lost a potential sale. While I’m on the topic of business cards, I thought you might like to see a gallery of business cards from voice talent. Clever marketer and fellow voiceover artist Peter O’Connell recently asked voice talents to send him an image file of their business cards. You can see them on his web site. I’m also posting my current business card on this page. 4) Having your own web site and owning your domain name is becoming increasing important in cementing your identity in your prospects’ minds. While I didn’t have Ralph’s card for long, I had it long enough to see that he didn’t have a web site. His card had the instructions search for Ralph on Google. I did a Google search for “Ralph artist”. Since I don’t even know Ralph’s last name, I don’t know which of the 7,180,000 results relate to the guy I met on the ship. 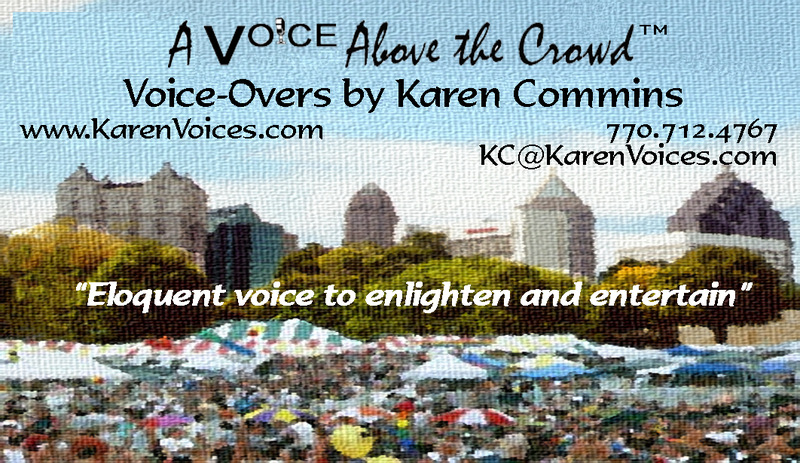 Many voice talent use their profile page from one of the voiceover pay-to-play sites as their web site link. Some kind of personal web site is better than Ralph’s, but it is not the most effective strategy for your business. If you want people to remember you and come to you when they need voice talent, why would you market yourself as one of thousands of talent all vying for attention at one site? I also don’t recommend using personal web space from your ISP because it includes the ISP domain name, and the long link name can look like voiceover is your hobby. It’s worth the money to own your unique domain name and create your web site. Whether on my business card, my e-mail signature, or anything I distribute to potential and current clients, I include only the link to my own site and my Twitter address. 5) When you cut your price, you are the one who bleeds. I couldn’t believe it when Ralph said he cut his price at a Beverly Hills show. Think about it — he was standing in one of the most affluent areas in the world, yet he caved and sold his work for almost half of his original price! He immediately regretted cutting his price when he realized that his buyer easily could have afforded something even beyond his original price. I don’t fault his buyer or anyone for asking for a price cut. We all ask that question at some point, especially in a situation where we think the price is negotiable. Pork: Miss Scarlett, ma’am . . . Ah gotter know how much money hav’ you got lef’. In gol’? Pork: Dat won’ be ernuff. Scarlett: What in Heaven’s name are you talking about? Pork: Well, Miss Scarlett, Ah seed dat no-‘count white trash Wilkerson dat useter be Marse Gerald’s overseer here. he’s a reg’lah Yankee now an’ he was makin’ a brag dat his carpetbagger frien’s done run de taxes way up sky-high on Tara. Scarlett: How much more have we go to pay? Pork: Ah heerd de tax man say t’ree hun’red dollahs. Scarlett: Three hundred! Might just as well be three million! But we’ve got to raise it, that’s all! Pork: Yas’m . . . How? Scarlett: I’ll go ask Mr. Ashley. Pork: He ain’ got no t’ree hun’red dollahs, Miss Scarlett. Scarlett: I can ask him if I want to, can’t I? If you feel tempted to compete solely on price, you might want to read another post-vacation story titled Cruising for a competitive advantage. Will these lessons from Ralph the artist help you in marketing your voice-over business? I look forward to reading your comments on the blog! Thanks for the nice plug. Thanks also for your submission! The business card gallery is only gallery I’ve been to in a while (two small kids = playgrounds) and I really like the art there 🙂 ! Hi, Sarah! I usually post an article 2-3 times a month, but I don’t have a set schedule. I appreciate your kind words, and I hope you’ll enjoy reading the archives until my next post! Thanks again for your interest and support. Best wishes for your every happiness and success! Thanks, Karen! It sounds like you had a great lesson/reminder in marketing yourself, even though the social setting didn’t necessarily call for it. Greetings, Catherine! Marketing is one of my passions! When I observe other people, I often see parallels that can be used in furthering a voiceover career. I’m glad you liked the post. Thanks for stopping by the blog!